Skalden flyttar. FI 1927. PC: Suomi-Filmi. P+D+ED: Erkki Karu. DP: Frans Ekebom - camera assistant: Armas Fredman. Make-up: Hannes Kuokkanen. Compilation score for the cinema orchestra: Musette (comp. Jean Sibelius), Viens (comp. Pearcy), Valse lyrique (comp. Jean Sibelius), Vappu shimmy (comp. Sjöblom), Tonttujen tanssi (comp. Ilmari Hannikainen), Valse chevaleresque (comp. Jean Sibelius). Studio manager: Martti Tuukka. Stills: Kosti Lehtinen. C: Ossi Korhonen (Eero Heso, a poet), Glory Leppänen (Mrs. Tuisku), Uuno Laakso (Mr. Tuisku), Birgit Sergelius (Liisa, sister of Mrs. Tuisku), Heikki Välisalmi (uncle Turpeinen from Joroinen), Heljä Salomaa (a two-year-old child), Hannikainen. Helsinki premiere: 13 Nov 1937 Kino-Palatsi, distributed by Suomen Biografi Osakeyhtiö - telecast: 19 Jan 1970 MTV1 - vhs release: Suomi-Filmi. Runoilija muuttaa was produced in a hurry as a supplement film to the feature film Vaihdokas which had proved too short. The screenplay was adapted, probably by Erkki Karu himself, from a previous Suomi-Filmi comedy called Se parhaiten nauraa, joka viimeksi nauraa [He Laughs Best Who Laughs Last]. The result was so successful that some critics found the comedy short better than the feature. There was also a plan to launch an entire series of short Suomi-Filmi comedies, but the plan was not executed. I had previously seen only a modest vhs tape of this comedy, and first now I realized how good Runoilija muuttaa is. It belongs to the top films directed by Erkki Karu, and it is better than the more famous When Dad Has Toothache. It is an important link in the development of Finnish screen comedy. The poet is evicted due to unpaid rents, his belongings are thrown onto the street, and unannounced he moves to the home of his best friend, Mr. Tuisku, to the dismay of Mrs. Tuisku, and to the delight of her sister Liisa. The poet has financed his extravagant lifestyle by the generous support of his rich uncle whose sole inheritor he is. But the poet has been lying about the circumstances of his life, and now the uncle has just arrived into the capital from the province of Savo. The main strength of Runoilija muuttaa is the good cast. Glory Leppänen, daughter of the opera star Aino Achté, was then a promising young actress at the National Theatre; later she became a prominent theatre leader and director. After Erkki Karu died suddenly in 1935 she got to replace Karu as a film director and became the first woman in Finland to direct a film. She plays the formidable Mrs. Tuisku. Uuno Laakso in his second film role, his first for Suomi-Filmi, was also a prominent theatre actor, and he became a mainstay of Finnish film comedy, especially with Suomi-Filmi. He is already quite recognizable here, but not yet mannered. Birgit Sergelius is bright and cinematic and a harbinger of the future, the witty film comedies of Valentin Vaala. After a few Finnish silents she moved to Sweden and was picked by Gustaf Molander for the title role of Charlotte Löwensköld. Heikki Välisalmi was a politician (also a MP), a prolific author and newspaperman - and a film actor in some ten films, usually for Erkki Karu. He is a natural as the rich uncle from Joroinen. (He also plays the leading role in our main feature today, Mr. Elanto). Having gotten used to see often wooden Finnish film acting in this period I was pleasantly surprised by the good interplay of these four. Glory Leppänen is perhaps too good for this kind of light entertainment, but the others have a good sense of pantomime and comic timing. Only Ossi Korhonen in the title role is a bit bland in this debut film of his, but not obtrusively so. He went on to have a long theatre career, and almost 70 film and tv roles. The uncle arrives with a load of gifts, including a rocking horse for the poet's presumed baby. He also produces a giant kalakukko (fish pie baked in a huge loaf of bread), a local delicacy from Savo. Towards the conclusion the uncle discovers that everything the poet has been telling him is lies - there is no wife, no home, and no baby. Unperturbed, he takes the situation into his own hands, launches the arrangements that the poet will have a wife, a home, and a baby, and announces that he will stay in Helsinki until that has been achieved. The bright Liisa, the sister of Mrs. Tuisku, has been behind the scenes arranging things and saving everybody from catastrophes. 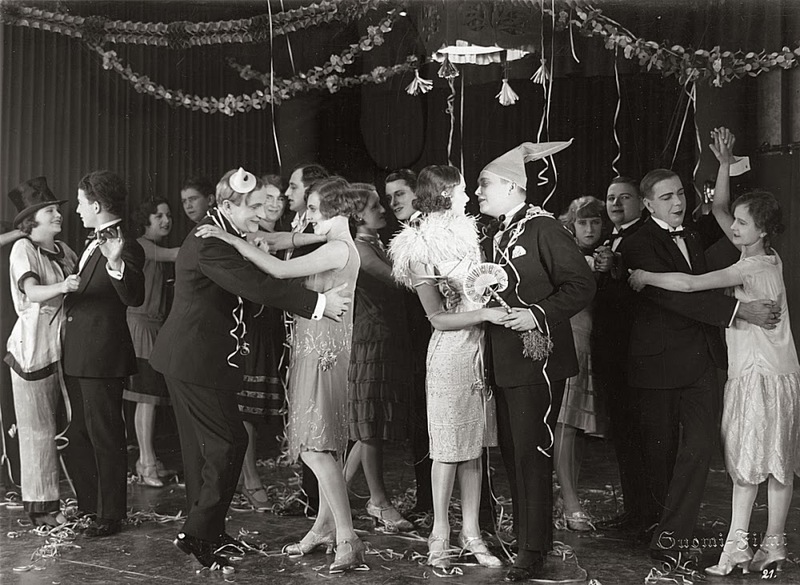 This well-made light social comedy anticipates Valentin Vaala's efforts in the 1930s. The digital restoration is successful. It is almost all interiors. There is a nice balance in the definition of light, the grayscale is pleasant, and it feels good to watch this in refined black and white.